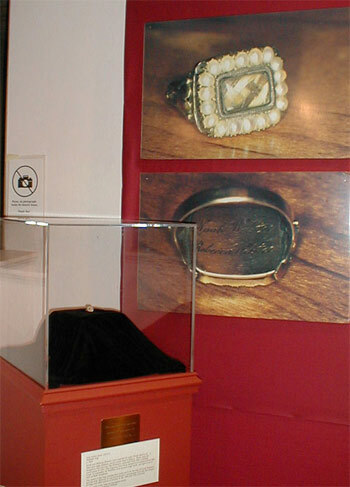 The ring came to the Noah Webster House in 1975, as a gift from a descendent of Noah and Rebecca Webster. When it reached the museum, it was put in a safety deposit box for safekeeping. Over the course of 21 years, the ring was forgotten. Luckily, it was rediscovered in January 1996. We know of three pieces of jewelry that resemble this ring. They were all made between 1806 and 1812. It was not unusual to incorporate hair into the design of rings and other pieces of jewelry in the 18th and 19th centuries. One similar piece was a mourning ring. The hair of a deceased man was placed under crystal and surrounded with pearls. The back of the ring was decorated with black enamel, and inscribed with his name and the date of his death. Another ring and a handkerchief pin were tokens of friendship. Abigail Adams had them made using her own hair, that of her husband, John Adams, and a friend, Mercy Warren. 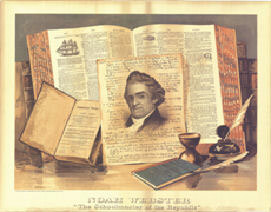 The Webster ring may have been created to mark an important event in the Websters; life. They celebrated their 25th wedding anniversary in 1814, so it might have been designed to commemorate that event. There is a chance that the Websters had several rings made, and gave one to each of their daughters. We will never know the true story of the ring, but we do know that it represents a form of art that was common during the Websters; life time, and that it shows a side of Noah that is not often seen: Noah as a devoted husband and family man.